VOR and NDB navigation, copying my first clearance and manoeuvering in IMC at night? When my instructor told me about this lesson I got a bit nervous. This was going to be tough, I thought. 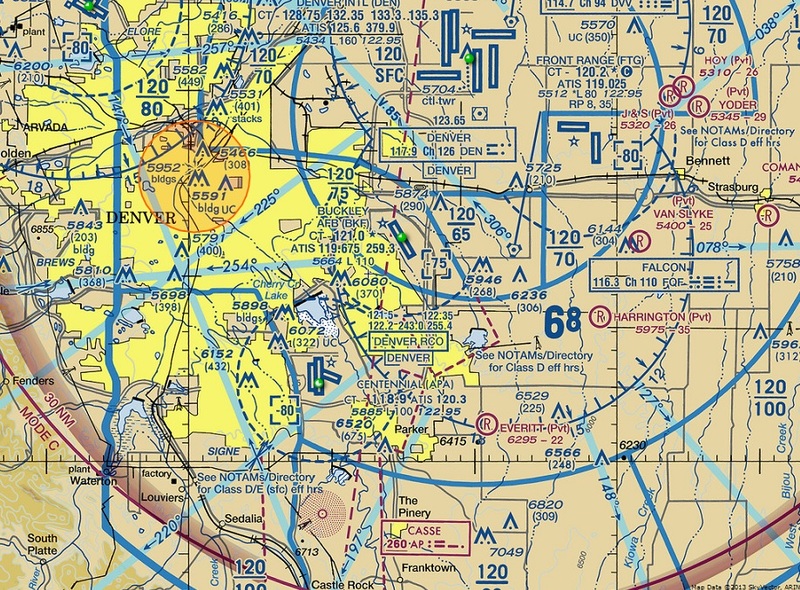 The busy Denver area, see the orange circled TFR that prohibits flight and tells every pilot to stay at home and watch American Football. Josh made up an easy clearance and I started to copy it on my kneeboard. An acronym called CRAFT helped me well and the only challenge is to write in a brief manner. It feels like copying a ATIS message. With my instructions written down I took off in the Redbird simulator. Soon I was in and out of clouds and was told to intercept a radial and fly towards Falcon VOR. I nailed the needle to the middle of the instrument and soon Josh saw that I didn’t have any trouble with this, he asked a few specific questions about the instrument and then he asked me to fly to the Casse NDB. I could only home towards it. Homing means that you simply turn until the station is literally off your nose. The problem with that technique is that in a crosswind you will not track to the NDB in a straight line but in a long dog curve. Tracking a NDB needs a bit more brain, unfortunately I was occupied with all the other challenges of flying in clouds so we simply hit the pause button – I like simulators. We discussed the math and technique and then I tried it and it even worked. It required quite a bit of situational awareness but I think as soon as you understand it will be natural. Even a wind correction for a 30 knot wind wasn’t that difficult to figure out. The reason it made me so nervous was probably because my only wrong answer in my PPL written test was in fact about NDBs. Now I had for sure something to study and train at home but I was happy to see that it was no magic. I learned that tracking a NDB is a very conscious process, you never just try as you would when homing. Now it was time for some manoeuvering in instrument conditions. First I had to fly a 60 degree steep turn to the right and left followed by a power on and power off stall. It surprised me that there was nothing special about it. In reality I suppose that spatial disorientation is a major problem. A stall is easy to recognize on the instruments and since a stall always requires a certain angle of attack, which the pilot controls using the elevator, it should never be a problem to recover. The critical factor, the angle of attack, is never available be it during day, night or instrument conditions.